If you want a shed that has a very modern look, then the Apex Roof 19mm Designer Garden Shed could very well be the shed for you. This is one smart looking shed that offers you many different ways to tinker with the design so you can have the shed of your dreams. The shed has a very smart looking door that first of all offers plenty of space to get in and out of the shed. This door also has a very cool triangle window on the front. To give the front of the shed a little bit extra protection is a large overhang which also helps add to the style of the shed. 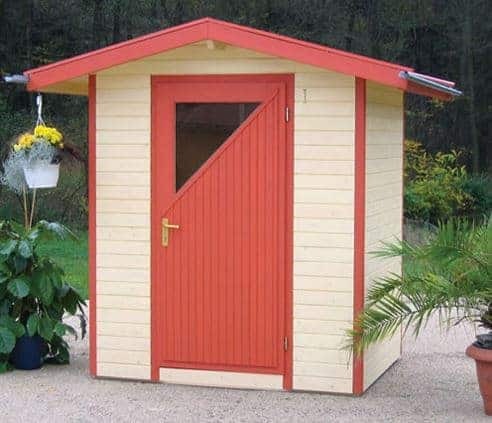 This is a more compact sized shed, but it still offers plenty of floor space for you to make use of. With a strong and well made frame, the 19 mm thick tongue and groove cladding is extra strong. Because of the cladding and the frame, this is a very robust shed that is going to last you many years. It is not just the wall that is very strong – the floor and the roof are also made to be extra strong as well. This is a shed that does not just look good, it is also very well made. No doubt the design of this Apex Roof 19mm Designer Garden Shed caught your eye as it certainly caught ours. This is actually kind of a hard shed for us to review. Not because there is anything wrong with it, but this is a bespoke shed so they are willing to let you tinker with it and get it just the way you want. 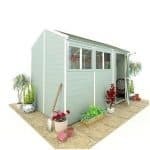 So for the purpose of this review, we will be looking at it in its most basic and standard form, but please note that you can ask them to change things about the shed so it fits your needs. The overall design is really cool, we feel like it looks a bit like a kiosk you would see in an amusement park. 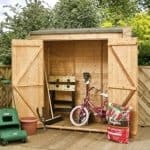 The shed is 5 feet 9 inches in its width and depth so you have a good box shape to make use of. At its highest point the shed stands at over 7 feet high. Even at the eaves the shed is 6 feet 5 inches, so as you can see, as far as headroom goes this shed is very impressive. The roof is a huge highlight of this shed. It has a rather large overhang which will protect the front of the shed very well. The roof is made with solid boarding, but it is what covers this that makes it so special. Rather than just use standard roofing felt, this shed has felt tiles and we just love the way they look. As well as looking good, these felt tiles will also protect the boarding underneath them. The cladding on the Apex Roof 19mm Designer Garden Shed is 19 mm thick tongue and groove shiplap cladding. This kind of cladding is perfect for keeping out the rain as it offers no areas for it to sneak inside. Also the cladding is very thick, much thicker than what most other sheds offer. As you can see, the cladding as well as being practical is also very easy on the eyes. They do not actually say what kind of framing is inside here, but as the cladding is 19 mm thick, we would have to say that even a standard 28 mm x 28 mm frame that most sheds have would be fine. Still, we do wish they would just come out and say exactly how thick the framing is. Under your feet is a solid and impressive tongue and groove floor. Here at WhatShed we love a tongue and groove floor as it looks so much nicer, but it is also some of the strongest flooring you can get. When we see a shed with a tongue and groove floor like this one, we have no worries at all about what people will be storing in it. 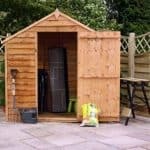 They do make it a point to mention that the shed you will be receiving is not treated, so you will want to make sure that you have a nice tub of wood treatment ready for once you have installed the shed. This is a really good looking shed, so to keep it that way, you will need to give it a fresh coating of treatment once a year. The Apex Roof 19mm Designer Garden Shed does not actually state what kind of warranty it has. 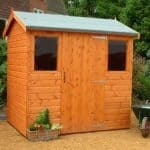 Most sheds of this style have at least a ten year guarantee, but we would still recommend you ask before you buy what their guarantee is. As the shed is not treated, we would expect that the guarantee is dependent on you treating the shed. The door is located right in the middle of the front of the shed and it looks great. We really cannot say enough things about the style of this shed. They have really made sure that the door has a lot of personality. This is a single door, but it is actually a very decent size with the height being 6 feet 1 inch and the width 2 feet 8 inches. Of course a major highlight of the door is that triangle window which finishes it off perfectly. The door also has adjustable hinges, which to us sounds very weird, but it just means that the hinges are extra strong and can be positioned just how you want them. As we just mentioned, there is a triangle window on the door. We have seen a ton of sheds and we really cannot think of another one that has a window like this. The window is made from actual glass and it has a little bit of a tint to it. If you look really closely, you will notice that the Apex Roof 19mm Designer Garden Shed has a proper door handle on it. Included with this is a proper lock. We really like this as it gives the shed some proper security and does not require you to mess around adding padlocks, pad bolts or sniper towers in your garden. This is actually a very private shed. There may be a window right in the middle of the structure, but this is a small triangle window that has a bit of a tint to it. This means it is not very easy to look inside at all, which is great if you want to make sure your belongings are kept hidden away. This is a shed that can be tinkered with pretty much any way you want. You can have the roof changed to a pent one, installation service, painted, added windows, different roofing felt and so on. 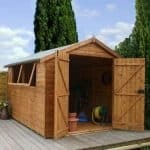 As we said near the start of this review, this is a shed that offers just a ton of customisation options, but they do not actually list them all, tell you what they do or even most importantly, how much they all cost, If you would like to make some changes, give them a call and talk it out. We actually think they would be willing to consider any changes that you can think of. They offer two shelving options with this shed. First of all is a five tier shelving unit which costs £63.95. This is a decent set of shelves that will help keep the shed tidy. If you want a little bit more shelving, then you may be interested in their double pack of four tier shelving which comes in at £101.95. From the top to the bottom this is a very well made shed. Even in its most basic form, this is a high quality shed. As long as you give it a fresh coating of treatment once a year, we can see you getting 20 or more years of use out of this shed. The materials they have used are high end, so they are designed to last a long time. This is offering you about 6 x 6 of floor space, which is not exactly a lot, but with the right kind of organisation this space can actually go quite far. The roof is extra high, so you can stack things up quite far which can help give you that little bit more storage. We do not see you having any major problems or freak outs resulting in in you hitting the ground with your hammer. With the help of another person, you are looking at 4-6 hours. Even those who normally shy away from DIY should not have any major problems installing this shed. 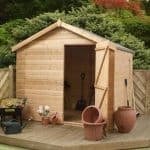 Look, this is one very well made and great looking shed, but the price is very high. The Apex Roof 19mm Designer Garden Shed is one of the smartest and most modern looking sheds we have seen in quite some time. You look at this and just know right away you are looking at something cool. The shed has many, many customisation options, which if you know exactly what you want is great as you can alter many aspects of it. The materials they have used are top of the line all the way through and that is the main reason as to why the price is so high. We do feel that this is one very expensive shed and in all honesty as cool as it looks, we would say that it is only really for those of you who have a really high budget and want to have something modern and hip.